Suitable for relaxing by the pool or walking on the beach, the Aqua Sphere Domino adjustable pool sandals offer a comfortable fit and a soft feel and have a durable EVA sole which makes them lightweight and flexible. 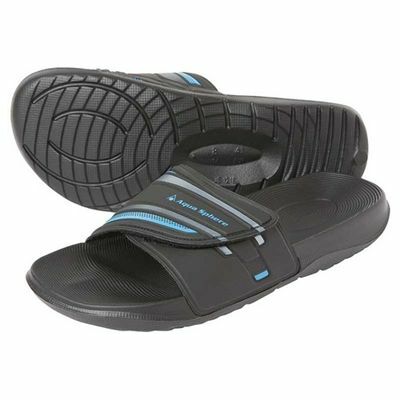 These sporty sandals provide easy adjustment and keep the foot securely in place thanks to a Velcro strap. for submitting product information about Aqua Sphere Domino Adjustable Pool Sandals We aim to answer all questions within 2-3 days. for submitting product information about Aqua Sphere Domino Adjustable Pool Sandals. We aim to answer all questions within 2-3 days. If you provided your name and email address, we will email you as soon as the answer is published. Easy to order. Delivered on time. Just what I wanted. Good quality. Would recommend. for submitting product review about Aqua Sphere Domino Adjustable Pool Sandals.